While I was at work during the summer, I had a bit of a brainwave. You see, the dilemma facing me was developing healthy habits when I’d be all on my lonesome in Van-city. I made a short list of habits that I wanted to try to keep up during the school year and had to re-prioritize them several times. Yet I lacked some sort of motivator to help me get along in these habits. Then I realized another problem: how was I supposed to control my spending in a land filled with delicious food and a credit card by my side? The answer, my friend, lies in this bulletin board. This is what it looked like before I started. 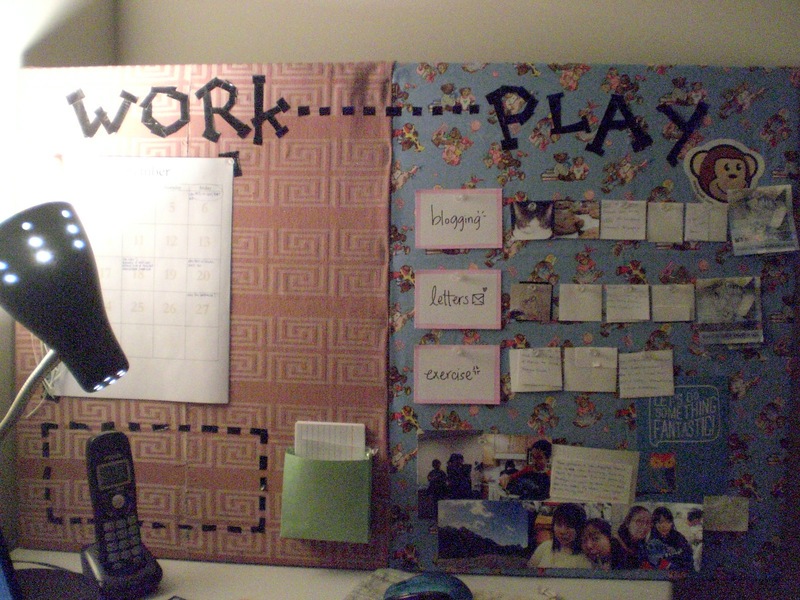 And the following is what I did to the poor corkboard to re-purpose it for my schemes. I started off by stripping everything off the board (except one very helpful sticker) and reinforcing the back side with cardboard, since the cork layer itself was pretty thin. This is where saved delivery boxes can come in handy. 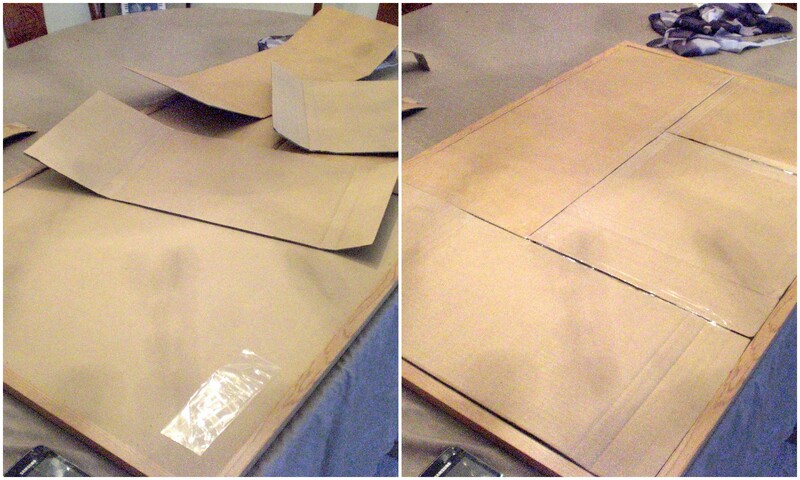 Most of the cardboard boxes’ pieces fit real nicely into the board and there was actually much less trimming and cutting than I thought I’d have to do. 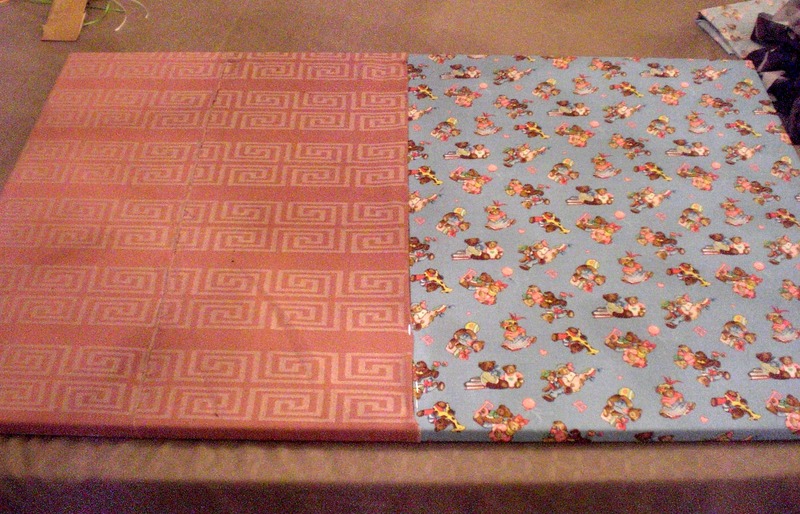 Next came the fabric layer. I took a few pointers from Pinterest and other home and gardening websites and covered the board with fabric so I wouldn’t have to waste time with paint or wallpaper for a new background. As you can see, I wrapped my sheet of fabric around pretty tightly and secured first with pushpins (to hold down the fabric temporarily), then with staples (for a more permanent fixture) and then with packing tape. 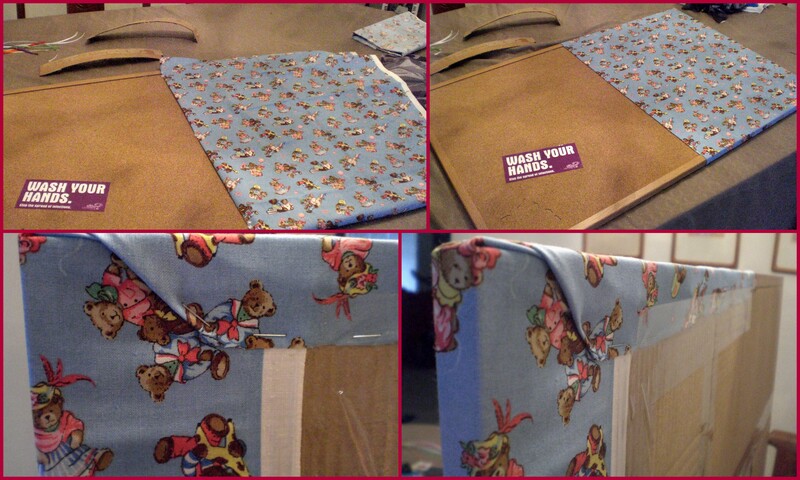 The packing tape was done more so that the fabric wouldn’t fray over time. By the time I had finished with the first piece of fabric I was pretty used to pinning so the second part went on much quicker. 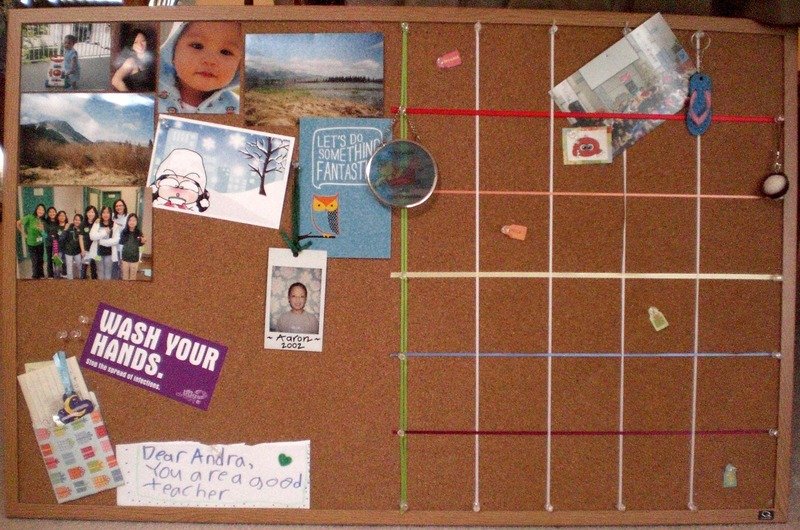 If you’re doing something similar and realize that your staples are in the wrong place, the great thing about staples is that you can pull them out of the cork board without much struggle. Also, don’t pull your fabric too tight or your staples will definitely pop out. The longest part of this project was really the decorating. All the black outlining you see on the board was done with strips of black duct tape (and yes, that is a Think Geek monkey sticker. Cool, right?). On one side I have a calendar and cue cards on which to write down important dates and assignment information. Theoretically the hanging ribbons can be pinned from a due date to it’s corresponding assignment details, which will be written out on the cue cards beside the month. The “Play” side contains the product of my brainwave, although I’ve altered it slightly since the photo thanks to a pro-tip from Coral. For every blog post I write (with a minimum limit of 250 words / post) I give myself one token. When I reach the x amount of tokens shown on the board, I award myself 5$ for spending money. The same goes for letters (minimum one page of writing, although this can be double-spaced) and exercise (minimum 40 min biking + weights OR 60 min continuous walking); completing each section earns me 5$ and can be repeated as many times as possible. 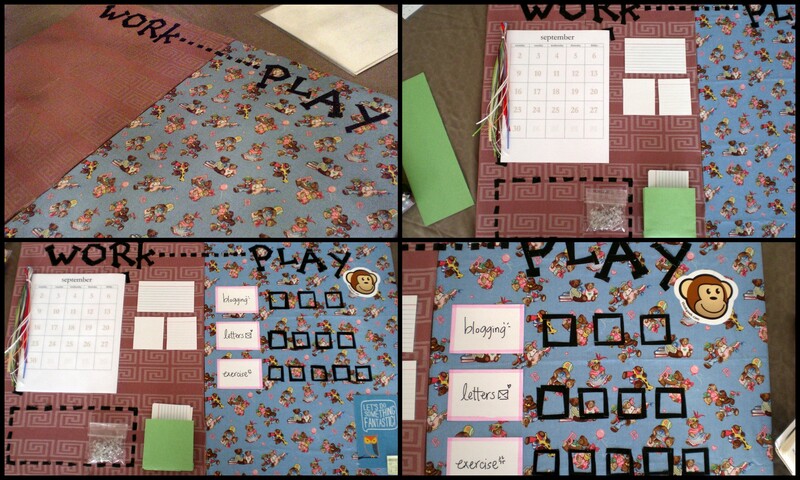 This is the finished product in action (although there aren’t many homework assignments due yet). As you can see I’ve already earned my 5$ for three sections of exercise (which is why the 5$ is gone from that section) and will be starting another one tomorrow. Coral’s pro-tip was to make exercise easier to complete because otherwise I’d be content to bang out as many blog posts as anyone would care to read, and let myself become unhealthy. This idea isn’t original, of course. I remember Dad doing something similar when I was young to teach Aaron and I how to appreciate all the small things in life. As young kids (before grade 3, I think) we had to earn signatures from Mum and Dad to be able to do certain things. To earn a signature, Aaron and I had to either practice half an hour of piano OR complete a module of math (we had a computer math program where we learned algebra and other fun things on our own) OR practice writing Chinese. Each signature earned was then ours to spend: 1 signature = 1 piece of candy, 5 signatures = trip to the swimming pool, and 10 signatures = ability to go to a birthday party. Of course, this meant we worked extra hard every time we got a party invitation, and we definitely kept ourselves busy over the summer. So thanks, Mum and Dad, for instilling in me a value of… well, je ne sais quoi. I just know you two were the ones that planted strange ideas like this one in my head and I’m rather grateful you did it (though maybe not as grateful when I was young and craving sugar). Oh, and this blog post counts for another token =D. Cheers!